If you’ve done any amount of reading on the topic of SEO, you will undoubtedly have come across the topic of exact match domain names – an exact match domain name is one that includes a precise keyword within the domain. For example, if you are trying to target the term “SEO training” in search, then an exact match domain name for this term could be seotraining.co.uk. The bad news is that even more “amateur” SEOs, web designers and domainers have become very clued into the exact match domain weighting – so much so that it’s increasingly difficult to find exact match domains. However, you do still have some options. Perform some keyword research around your main search terms and place these terms in an Excel document – ideally, you want a list of a minimum of 1,000 search terms. From here, simply find and replace all of the spaces in the search terms with nothing i.e. no spaces. Then, head on over to a bulk whois tool like that found at WHOIS.hm – this tool will allow you to perform domain availability searches across multiple domains and extensions at the same time. It’s a real time saver! It’s important to remember when using exact match domain names that only certain extensions will actually give you the desired boost in search – for example, in the UK these extensions are .org.uk, .co.uk, .com, .net and .co.uk. It’s also important to remember that the domain has to match the keyword precisely i.e. no hyphens, no numbers etc. A lot of “SEOs” may claim that domains which include the keyword and the hyphen work and they have the evidence to prove it with rankings, however it’s very unlikely they have worked for any relatively competitive search phrase. In fact it’s impossible, because they don’t work. 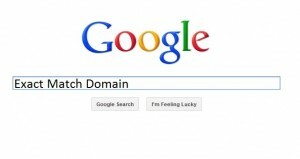 This isn’t a just put a website up and leave it strategy, you will still need to do link building behind the exact match domain name – that said, the idea behind using the exact match domain name is simply that it will give you a flying head start and a significant boost over the competition too, and for as long as Google continues to put weight behind it. Exact match domain names are great, however it’s also worth remembering the other factors you should be looking at too – for example, brandability. What’s more, it’s not advisable to simply use tens of exact match domain names to the exclusion of your main website, if that is your reasoning you would be better off ploughing all of your resources into one website. Gareth Mailer works as an SEO professional for Clickwork Media. Looking for SEO training courses in the UK? Visit Clickwork Media now for more information. How to check your position on Google from different custom Locations?